In October the EPA charged Maryland-based Clean Green Fuels LLC and Texas-based Absolute Fuels LLC with allegedly producing invalid RINs. Obligated parties that purchased fraudulent RINs may face hefty fines and are required to replace those credits. BenchMark Energy Corp. has finalized an agreement with the University of North Dakota in Grand Forks to deliver 150,000 gallons of unrefined glycerin per month to be used as a Btu supplement in UND's existing coal-fired operations. On Nov. 29 Sloud Inc. announced the acquisition of Tucson, Ariz.-based SouthWest BioFuels Inc. 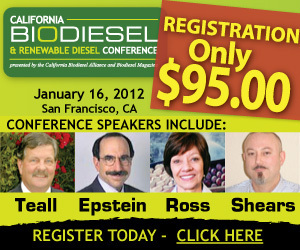 According to information released by Sloud, the biodiesel producer is working to develop algae-based biofuels and related biomass products. The organization is working to establish additional grease recycling locations around in the local community, including at select elementary schools, churches and community centers, with a goal to make more biodiesel available to farmers and schools. Nabarro LLP recently announced it is advising Nandan on its initial public offering on AIM, which is the London Stock Exchange's international market for smaller, growing companies. According to Nabarro, it has valued Nandan at nearly $260 million. The system is trademarked the AlgaeAppliance and is a downsized version of the harvesting system employed at the MBD pilot scale plant in Australia. The company intends it to be an off-the-shelf device for any algae grower to use. 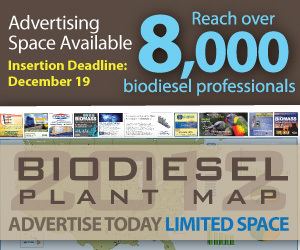 The industry has produced more than 802 million gallons of biodiesel in plants from Florida to Iowa to Washington State, the figures show, more than doubling last year's production and breaking the previous record high of 691 million in 2008. Buster Halterman and his team at San Diego-based Buster Biofuels have figured out feedstock acquisition and have also partnered with several major San Diego organizations.